Many fans have been wondering if we would be seeing any viral marketing for Watchmen like we had seen before with The Dark Knight's WhySoSerious.com and IBelieveInHarveyDent.com. The problem has been, how do you have a Web site that is supposed to “live” in the movie's world when the movie takes place in 1985 where there is — no consumer Internet? 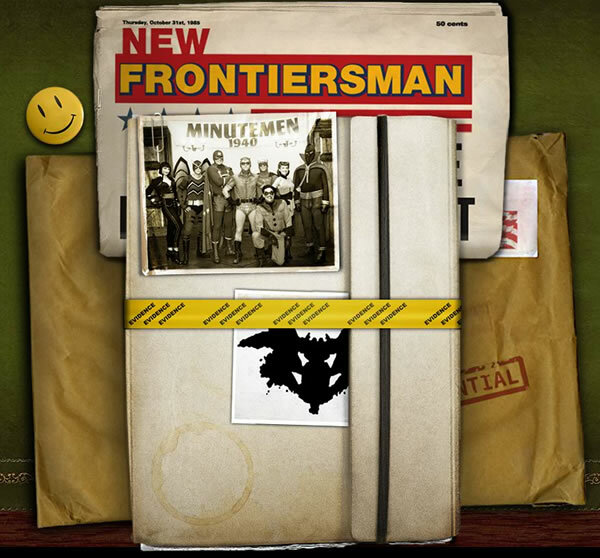 It's not clear how much of “The New Frontiersman” will be seen in the film adaptation, but inside the comic's pages articles from the tabloid paper appeared in some of the supplemental material, and was the publication that Rorschach mailed his journal to that detailed Veidt's plans. One wrinkle here is that the site is not being developed by Warner Bros., but by Paramount, the studio handling the Watchmen movie's international release. A representative from Paramount emailed me the following statement today explaining what fans can expect from this new site. …we have just launched a Watchmen viral microsite, www.thenewfrontiersman.net. As you probably know, in the Watchmen comics, Rorschach is obsessed with conspiracy theories, and gets much of his information from a far right-wing magazine called the New Frontiersman. There is no content on the site right now but the seal will break early next week, and there will be a fair bit of content on the site leading up to the release of the film, including photos, documents and video. So when exactly will this new site be updated? Well, Paramount has promised to give me the heads up when any new content is launched, so you'll know when I know.